When I was a kid I really didn’t like spinach, but it wasn’t something that my family ate, either. My Southern born and bred family ate turnip greens, and that was as close as we got to spinach. Well I’m all grown up now, and I loooove spinach—spinach salad, spinach pizza, sauteed spinach, spinach in sandwich wraps. 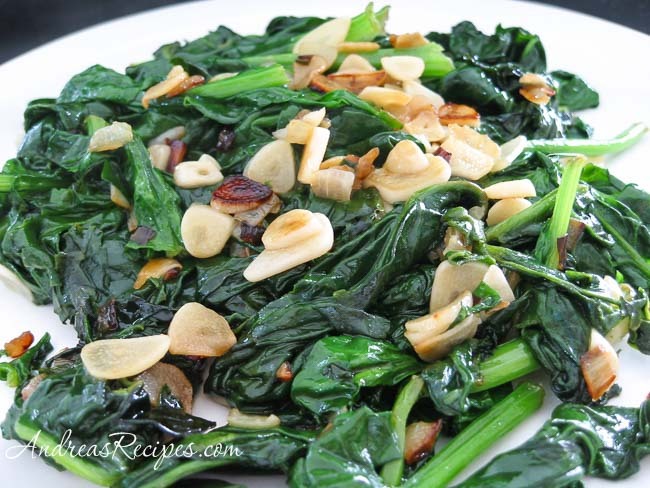 This is our favorite recipe for sauteed spinach. It’s so versatile that you can use it as a side for just about any meat or pasta, as a topping with feta cheese for pizza, and it’s great as a bottom layer in Crustless Quiche. Tear the large spinach leaves into pieces. Fill a large bowl with cold water and wash the spinach. Repeat 2 or 3 times until the spinach is thoroughly cleaned. Drain and squeeze out excess liquid if necessary. Heat a large skillet. Melt the butter, then add the olive oil, garlic, and chopped shallot. Cook until soft, about 3 minutes. Add the spinach by the handful and cook, stirring, until spinach is wilted. Continue to add spinach and stir until all the spinach is in the pan. Add more olive oil as necessary. When all the spinach is wilted and cooked through, season with salt and pepper and toss again. Serve warm. You can add 1/2 teaspoon of red chili flakes when sauteeing, or you can squeeze fresh lemon juice over the spinach before serving. For a more Italian flavor, you can add 2 small tomatoes, peeled, seeded, and diced when sauteeing and serve with 1/2 cup freshly grated Parmesan cheese sprinkled on top. You can skip the butter if you want to do a vegan thing. We just like the extra flavor it adds, and it’s not too much so we don’t feel overly guilty.